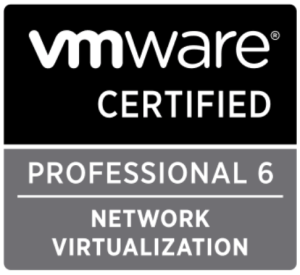 welcome to virtualcloudblog.com and thanks for checking it out. Today, I’ll write another post about DELL ScaleIO. Today I’ll try to explain how to increase/map/unmap ScaleIO volumes from Vmware perspective. 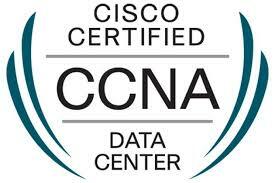 The process is quite simple, similar than other SDS vendors. 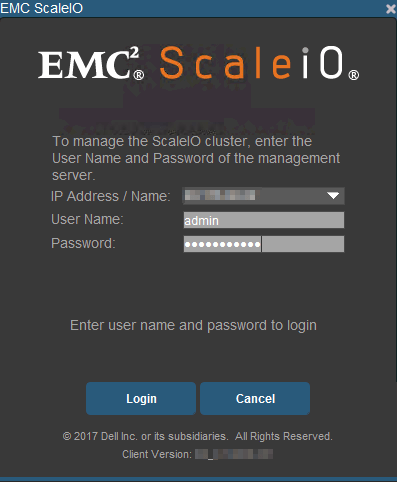 Go to ScaleIO GUI, using the admin, admin pass and IP of the master node, we connect to the system. Go to Frontend Tab, Volumes and select the volume needs to be increased. In this case, last volume in the list. After finishing, the new volume size is reflected from the GUI. Let’s go to VMware Web Client, to extend the LUN. First of all, perform a storage rescan from the cluster. 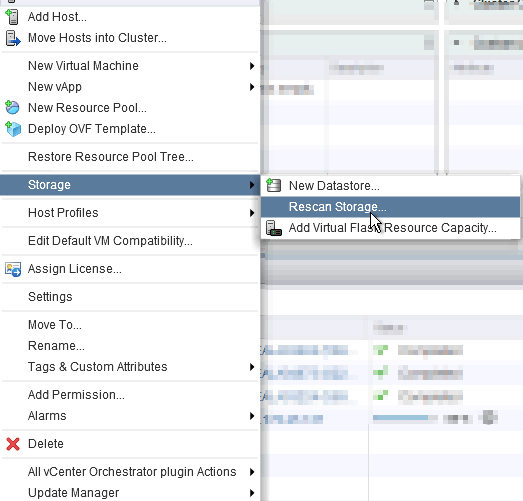 From Host and Cluster tab, select the cluster, right click, storage, scan storage. 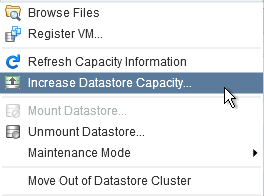 Once finished, from Storage tab, select the LUN, right click and Increase Datastore Capacity. From the Wizard, select the LUN you would like to extend, in my case, there is only one LUN. Finish! The LUN has been extended and the space is available. Steps to map a volume from ScaleIO. 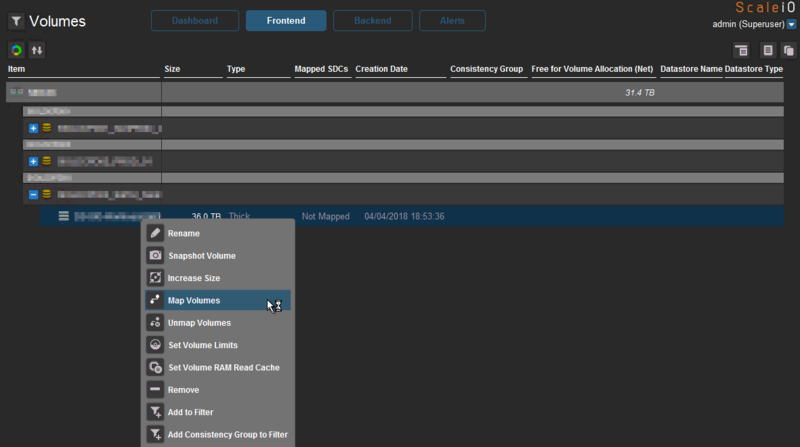 From ScaleIO GUI, Frontend tab, right click on the volume that needs to be mapped, and “Map volumes“. From wizard, select the host the volume needs to be mapped. In my case the LUN is mapped to 4 hosts. The click Map and finish!! Steps to unmap a volume from ScaleIO. Let’s go to VMware Web Client, to unmap the LUN. 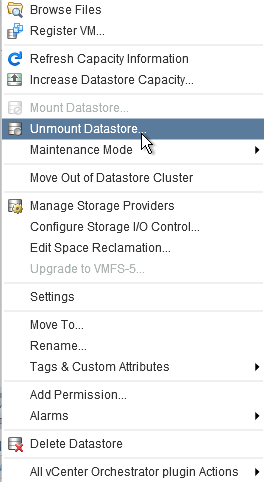 From Host and Cluster tab, select the cluster, right click, unmount datastore. 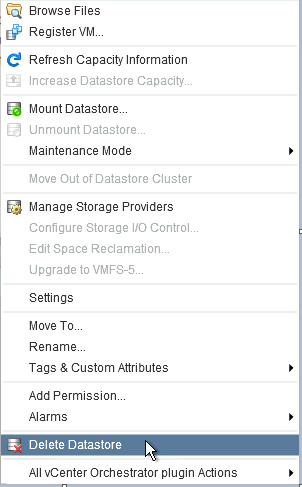 From the wizard, select the neccesary hosts and click OK.
It’s time to delete the LUN from vSphere. 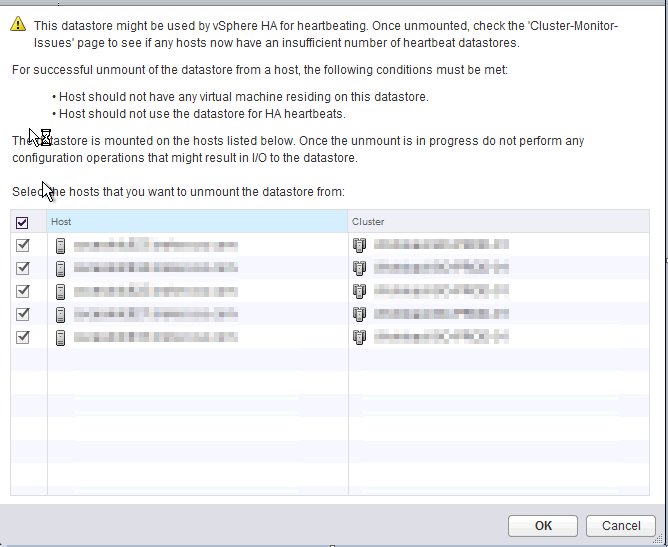 so from Host and Cluster tab, select the cluster, right click, delete datastore. 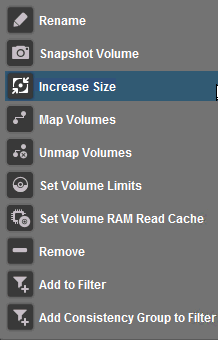 Now from ScaleIO GUI, Frontend tab, right click on the volume that needs to be unmapped, and then “Unmap volumes“. From here, select the host the volume needs to be unmapped. In my case the LUN is removed from all the hosts. 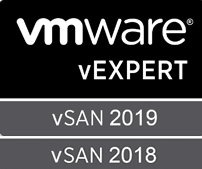 From vSphere Web client, perform a rescan, and the LUN is not longer available. I hope it helps you!! !